I decided on a fabric for the ruffle tote. It's 100% linen in natural. I let my daughter choose the binding fabric; she said this one didn't look like a diaper bag print. I used the measurements from this pattern, but made some changes. I made my own lining, added key and cell phone pockets, changed the binding, and rather than folding the ruffles in half, I used the serger and did a rolled edge. I also left out the interfacing. I used it all day today and I really like it. I wouldn't recommend this pattern to an absolute beginner as there are no actual instructions, but it's pretty easy to put together. I also finished my Hope Valley pinwheel sampler quilt top this afternoon. I was thinking about hand quilting this one, but I can't decide. I don't know that I love it enough to put that kind of work into it. I'm not in a hurry to get it finished, so I'll think about it for a while. Did you have a productive Saturday too? Great bag!! Love the look with the linen! and yep...I DID have a productive day too! :o) Looking forward to more of the same tomorrow too! Have a great weekend! Glad you had a productive day! Unfortunately, your flickr photo seems to be unavailable. I would love to see your project. Thanks for letting me know on the photos, Jackie. I can see them but I replaced the links, so hopefully they are working now. 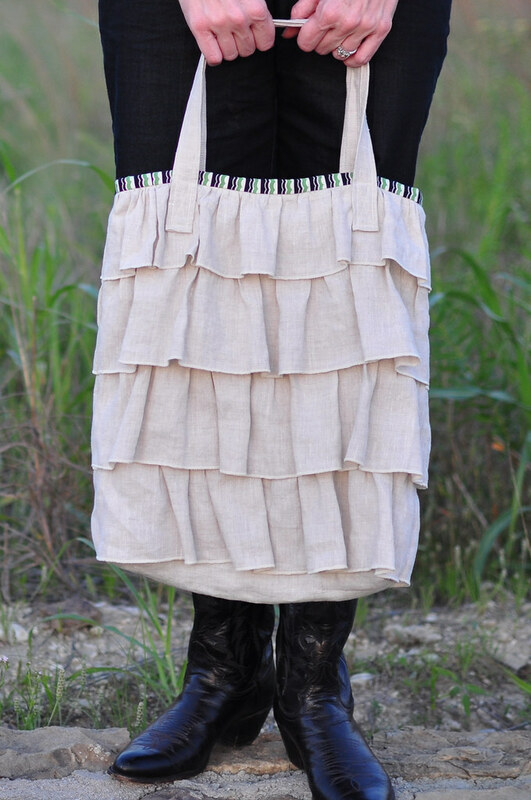 I LOVE the ruffle tote! I think I may have to try one. Your pinwheel top is also lovely. Thanks for sharing. As for me I had a busy Saturday but not productive in the sewing room. Great bag!! I think it came out awesome. The linen definitely makes for grown up ruffles. Very chic! The pinwheel sampler is a beauty--I know why Hope Valley is so popular, all those color combos look terrific. Cute bag! Love the linen with the sripey binding. And oh - that quilt is beautiful! 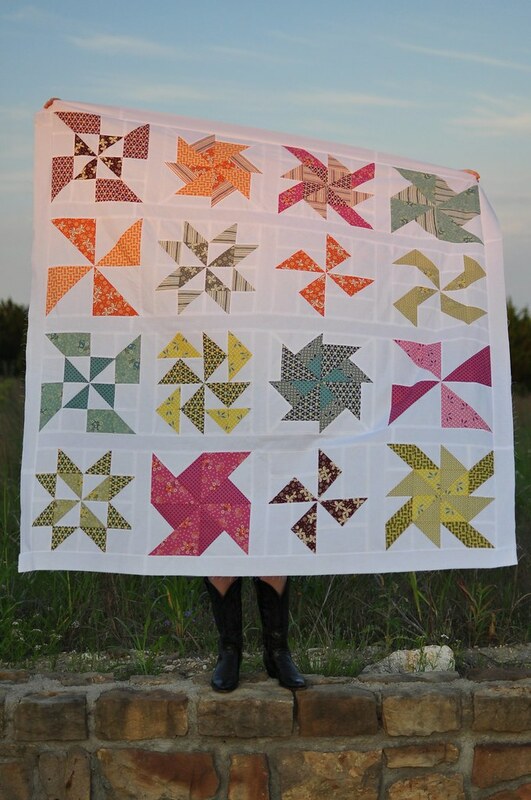 I love love love the pin wheel quilt - I still really want to make this one and I love the fabric colour combinations. Your pin wheels are great. I love that fabric and I love how you put it together. Can't wait to see the finished product. OMG! The quilt is lovely and the bag is really cute! I just love the Texan BLACK BOOTS! Too cute! Is this your signature 'look'? If not, consider it! I love this quilt, and I'm adding this quilt-along to my list, along with the hexy charm quilt, and a Flying Geese quilt...yes it's becoming quite a long list! So far I've only done squares and stripes in quilts, but I'm happy to say I basted my first hexy this week!